Tezcatlipoca, the Mirror that Smokes, warrior/wizard god of the Aztecs. Western Civilization thought it wiped him out centuries ago. 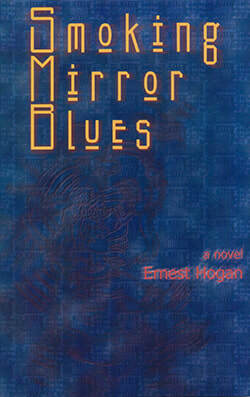 Ernest Hogan was born in Los Angeles. His mother's maiden name is Garcia. He has climbed pyramids from Teotihuacan to Chichen Itza. He has worked as a cartoonist, illustrator, writers, all-purpose stooge, and a consultant on pre-Columbian mytholgy and applied surrealism. His novels, Cortez on Jupiter and High Aztech, are internationally acclaimed. His short fiction has appeared in Science Fiction Age, Amazing Stories, Last Wave, New Pathways, Penthouse Hot Talk, Pulphouse, Proud Flesh, The Red Dog Journal, Analog, and the Semiotext(e) SF anthology.